Even though I’m not quite finished up the knitting & crochet projects that I have planned for Christmas gifts (I still have 10 DAYS, people. Don’t judge me), I have already begun to think about a more involved project for the Christmas break. I am fortunate enough to work for an organization where I get the days between Christmas and New Years off, and it is quite lovely. So during that time, I often embark on a more involved project, which involves sitting on the couch for days at a time, getting up only to replenish my coffee (& Baileys). Which one should I make this year? I hadn’t seen this lovely cocoon-style cardigan, the Inmost Cardigan crochet pattern when I was looking at cocoon cardigans a little while ago. I love the colour this is made in and the zigzag rows in this pattern. This looks really interesting to crochet! Rainbow Trail pullover knitting pattern might give me a good base for where to start. I’ve knit myself cardigans and shrugs, but never a pullover. Also, I love stripes. If I were to make this Crochet Poncho Pattern, I would have to make it in a different colour, because it is nearly identical to a store-bought knit poncho that I already own. It is pretty and simple and crochet! Blankets also make lovely more involved projectst. The Makawee Blanket crochet pattern looks like it would be great to snuggle under by the fire while you work on it. So cosy. I’m not sure I’m going to get to these before Christmas, but I know my husband would love a pair of these Adidas Inspired Sneakers for Men. Or maybe I should finally conquer the sock? I’ve knit stockings. That’s like turning a heel, right? Is that the hard part? Anyway, this Bywater Striped Sock Knitting Pattern looks like a straight-forward and simple knit sock pattern, which seems like exactly where I’d like to start. Or I could work on a more involved amigurumi like this Garik the Pug crochet pattern. Isn’t he cute? I know I’m not going to get to these Hamilton Amigurumi Patterns before Christmas time, but I know one thirteen year old who would be super impressed by these! I would probably have time to get them all made by her birthday. Or possibly, I’ll take on a whole new craft. I have done a little bit of embroidery before, but mostly in junior high home ec class. This Blossoming Garden Embroidery Kit is gorgeous and would make a lovely little piece of decor for spring. It’s just around the corner, right? So, what are your plans over the Christmas break? Do you get some extra time off to hang out with your family or to make some crafts? What would you make for a winter break project? I know many of us to have grandiose ideas about getting our act together and making everyone on our holiday lists beautiful handmade Christmas gifts, but then the reality of life sets in and you need to accept that you just might have to compromise a little. You can still give great handmade gifts! And you can support real people with small businesses who are trying to make it as artisans. It’s one of the main reasons I love Etsy. It’s a great place to find unique, handmade gifts made ethically (and sometimes even locally!). Check out some of my handmade holiday gift picks. As always, while we’re shopping for others, we find some great things for ourselves. This winter sweatshirt is adorable and casual for the festive season. You can get one for your sister, or for yourself. While I’m not really a pet person, I love pet people. And pet people love their pets. Doesn’t this Felted Wool Cat Cave Pebble look so cozy for your kitty? Super sweet and would look stylish in any living space! Got a baby on your list? This simple and sweet crib sized heart baby blanket makes a lovely gift for a new baby. If you still have some time to knit, check out one of these patterns to make a special gift for the little one in your life. It’s often hard to find a nice handmade gift for the man in your life. 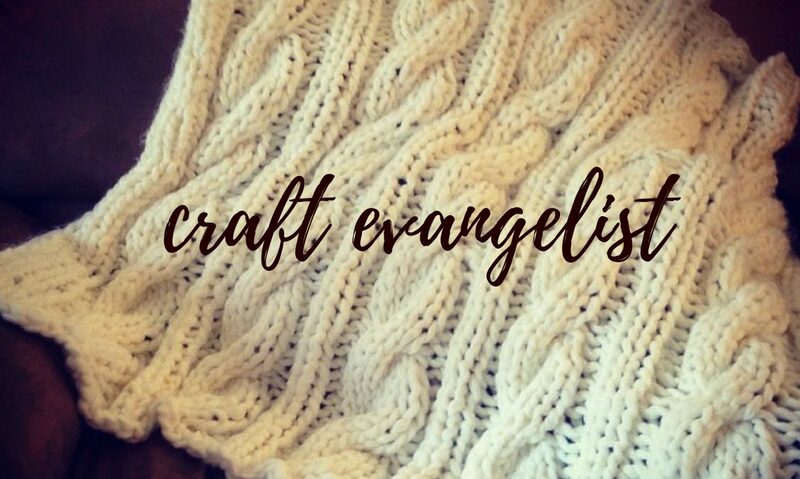 I always think that I might like to make Mr Evangelist a hand-knit sweater, but I never leave myself enough time. I would absolutely consider one like this men’s winter-themed knitted sweater. Christmas-y but not an ugly Christmas sweater. You need to get your order in quickly to give this crafter some time because I think it’s made to order, but it’s so lovely! Handmade stockings are such a nice family gift. If you don’t have time to crochet some yourself (I love this pattern), you can get these hand-crocheted Christmas stockings made for you by Creative Thread Yarn. While dishcloths can be a great handmade gift for colleagues and mother-in-laws, if your first try at crocheting isn’t going so well, you can pick up a couple of these handmade textured dishcloths for your MIL and pass them off as yours (we won’t tell). Ok, this isn’t something I could make, but somebody makes them and they’re gorgeous! If you have a baker on your list (maybe me!? ), I sure would I’m sure they would love one of these embossed rolling pins to make gorgeous holiday cookies! Or maybe you’re a baker and you could get yourself one of these lovelies to make some homemade cookies as gifts! Options! Handmade toys make such special gifts! Give this crocheted amigurumi deer stuffed animal to a special child in your life. Or if you have a little bit of time to crochet your own, check out one of these other reindeer amigurumi patterns here. I hope you’ve got a good start on your list, so you can get everyone taken care of and enjoy the festivities of the Christmas season ahead. You don’t have to do it all yourself, there are plenty of artisans who would be happy to help you get some special gifts for your loved ones. If you like these ideas, please share them on Pinterest! Ever wonder what I use to create these collages? It’s PicMonkey! Get a free trial with this link!